Hello out there, you fantastic readers! Did you have a good weekend? Yesterday my husband took me out and bought me some new perennials for my flower garden (yay), so I had a pretty great day. 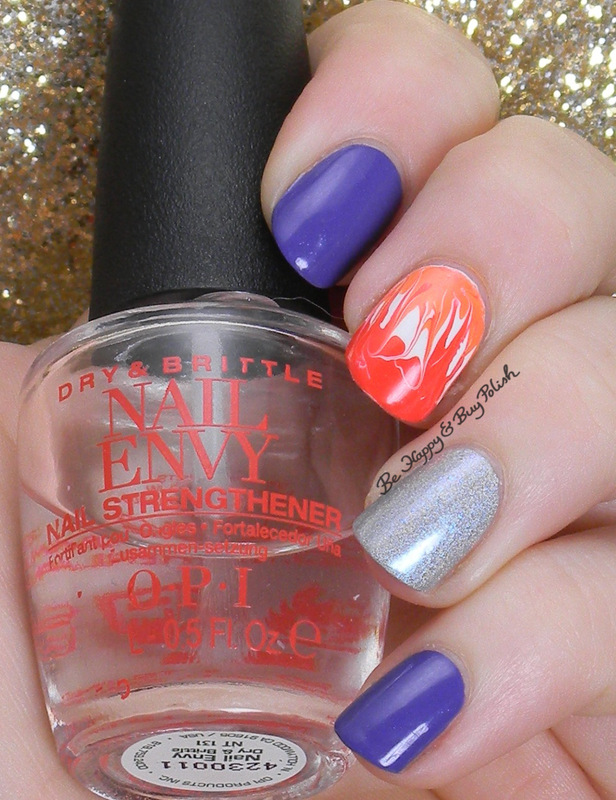 Today, though, I have a fun manicure featuring OPI and Girly Bits that I created last week. I started off with 2 coats of OPI Lost My Bikini in Molokini on my pointer and pinky fingers. On my ring finger, I used 3 thin coats of Girly Bits Accidental PPV. On my middle finger and thumb, I started off with a coat of OPI Alpine Snow, waited for that to dry, then applied another thicker coat of AS. While it was still runny, I applied a stripe of OPI Aloha From OPI (darker orange) and Where Did Suzi’s Man-go (lighter orange), then swirled them together with a long striping brush. Doing “needle drag” nail art is one of my favorite techniques to do, simply because it really is that easy and it’s pretty hard to mess up! One of my friend did her maincure using Lost my Bikini in Molokini & I love the color! I love all things purple but for nail polish I particularly love green. When I wore a bright, vibrant green Rimmel nails to work everyone complimented me on the shade! That needle drag looks like fire :D! Love the look. Love this look! Lost My Bikini in Molokini is at the top of my wish list now! I really like the colours you used here! And woot about the needle drag nail, I am pretty sure it’s not as easy as you want us to believe! Oh, it is easier than some nail art I’ve tried. LOL! Oooh I love the needle drag effect! What a fun skittle! Such a fun mani! I need to try the needle drag, it looks awesome. It is so much fun, too! What a pretty skittle this is! This had to have been fun to create. These are really fun! I never would have thought to put these polishes together into one look, but I love how these came out! Yay for perennials!! I need to do that myself!!!! I love everything about this. I’ve been wanting to try the needle drag technique for a while now and this turned out great!!! Thanks, Dani! I need to now get them in the ground. LOL! I think I could actually do a needle drag which would be miraculous. Beautiful manicure. I think you could too! Thank you, Marcia! Very pretty. Loved the needle drag look. Can you believe I’ve never done the needle drag before! It looks so freaking cool too, especially with the colors you picked out. That “needle drag” is pretty easy for me to mess up. Of course Ive never tried it with a brush before. I’ve always used a toothpick and gauged my base color no matter how lightly I swirl my colors around. That’s what kept messing me up, Katie, was the toothpick. Then I read on another blog that they had used a long brush and it just totally clicked!